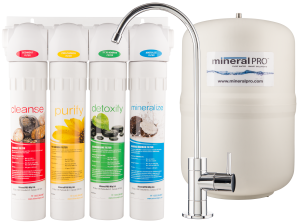 The MineralPro Alkaline Booster is designed to be used as an add on to new or existing RO( reverse osmosis) or UF ( Ultra Filtration) systems, either Mineral Pro systems or other similar systems. The Alkaline Booster delivers optimum alkaline, mineralised, great tasting, hydrogen rich water. Most RO systems produce pure water, but due to the lack of minerals in the water the water is very acidic, flat, almost dead tasting water and not the healthiest to drink or cook with, the Alkaline Booster puts the life back in the water! The Booster produces not only great drinking water, it is the best water for cooking and all your tea/coffee and ice. Is an easy install, no special tools or skills required, comes with mounting clips, and wrench for removing the filter cartridge. Filter consists of 9 stages of filter media, all NSF approved, and hand built in our factory in California, USA. The Booster reduces Chlorine, heavy metals, organic material, lead, is antibacterial, and produces the best tasting hydrogen rich, mineral alkaline water you can get with a PH ranging from 8 to 9.5! Add on to the Mineral Pro RO and UF systems to deliver optimum alkaline, mineralized, great tasting, healthy water!